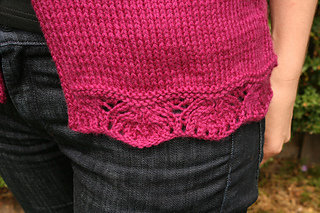 Knit in a gorgeously soft yarn, you will want Mirabor wrapped around yourself at all times. The cardigan is constructed in one piece from the bottom up with sleeves knit in the round and joined to the raglan yoke. A modified version of Porcupine Lace embellishes the body and sleeve hems; a bit of Feather and Fan adds a pretty effect around the neckline. Ribbing serves to define the shaped waist. Though most of the sweater is knit in Stockinette stitch, the shaping, lace, and fun techniques like an i-cord bind off will keep you on your toes. Equal parts comfy and chic, you can easily dress Mirabor up or down to suit any occasion. A note on fit: Mirabor is made to have little to no ease from the hips to the waist and quite a bit of ease through the armholes. Though the bust measurements are standard for each size, the ease in the armholes will give the front of the cardigan quite a bit of drape. The back measurement is half the final bust measurement (e.g. the sample, size S, looks as if it has ease around the bust, but the back measures 16.25” across).